Silicon (Si) Windows manufactured from optical grade silicon are popular for the 1.2 – 7μm spectral region due to their low cost and low density. Due to its low density (half that of germanium or zinc selenide), silicon is ideal for weight sensitive applications, especially those in the MWIR thermal imaging 3 – 5μm region. Density is 2.329 g/cm3 and Knoop Hardness is 1150, making it harder and less brittle than germanium. Inspection is necessary for high power and high voltage electric installations to avoid the possible accident, the thermal imagine is found to be the optimal and effective way for this application. In some countries, thermal imagine inspections is compulsory for accident insurance. And in some industrial equipment likethe high temperature metallurgic oven, it is necessary to use the thermal imagine to watch its temperature inside. 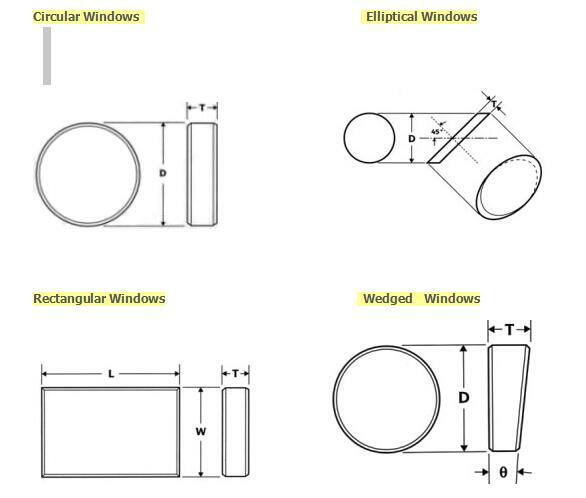 An infrared windows assembly is needed to be installed on the housing of the electric and industrial equipment as the viewport windows for thermal image camera. Confirm to the dust tight standard IP67 of NF EN6052. Step 4: Open the protective cover and make the testing of the inspection. Several factors you should take into consideration during the selection of crystals materials: Wavelength range, environment (temperature, humidity and vibration ect.) and cost. Here is the specification of the materials for your reference.